The Bradley Original Smoker is a unique smoking oven and stew, where food is cooked, fried or hot and cold smoked. 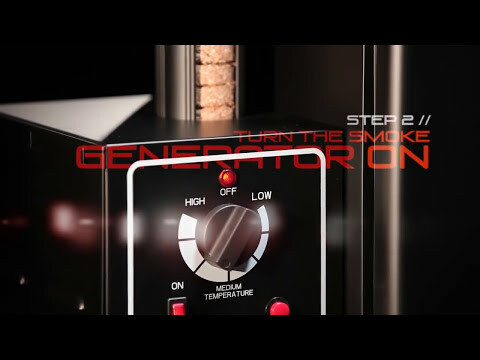 Complete with a smoke generator where aromas are burnt for 20 minutes at a uniform temperature and no gases, acids or resins are formed which can affect the flavor of the food at higher temperatures. It is light enough to be worn and has about the size of a small refrigerator. The Bradley Original Smoker produces aromatic foods without an aftertaste. While other smoking ovens must be constantly guarded, the Bradley Smoker will automatically clean the smoke for up to 8 hours without supervision and with the utmost safety. In addition, the Bradley Smoker can also be used as a hot smoking oven, a slow cooking appliance or a Schmorofen using the separately adjustable internal heating element. The low temperature of the cooking zone is perfect for any smoking project. It can also be hung hanging, with the smoker hooks attached to the upper grill. Equipped with 4 grids, thermometer, water bowl, grease drain pan, instruction manual and some recipes for the first start. • Internal housing: powder - coated steel • Internal housing: aluminum • Internal cooking surface: 26 x 32 cm x 4 grids • Internal radiator: 500 watts / 220-240 volts • CE approved • With temperature regulator • Weight: approx Do not exceed 138 ° C.